Team Assessment Survey is a great tool for a retrospective. This tool comes from a SAFe framework established by Dean Leffingwell. You can find the original assessment here. The exercise demonstrated in this blog post is an adaptation from Luis Goncalves. He also shares this exercise in his book co-written with Ben Linders “Getting Value out of Agile Retrospectives”. Each of the areas has different questions, which you can rate from 0 to 5. This allows a team to visualise what are the areas that need more attention in the team. 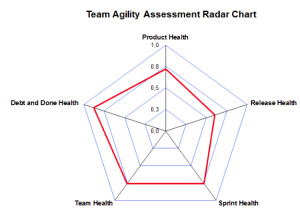 This exercise is awesome to reveal overall agile health of a team. Although this exercise is suitable when a team wants to understand better how well they implement agile, it does not require any special occasion. This exercise, however, will not solve specific problems that occur during the sprint, but it might acknowledge some reasons why those problems happen. For example, if your team finds many bugs during development, the problem might be that their unit testing or automation practices are not well implemented. It´s very simple. You will need an excel sheet. You should have 4 main areas I mentioned earlier: Product Ownership Health, Sprint Health, Team Health and Technical Health. Now create several questions for each different areas. These questions must be appropriate for your team. You can refer to questions from SAFe Team Scrum XP assessment, which you can find here. All these questions can be rated from 0 to 5, where 0 means “Never” and 5 means “Always”. During the retrospective session, the team needs to fill in the excel sheet and evaluate the team to see where they stand. For easier and more clear demonstration of results you can create a graphic, just like on the picture on the right side. Visualising the graphic will give a team a good understanding where they stand. They should be able to decide which area they want to improve. Choose one area at a time and one topic within that area. This exercise does not require to have a collocated team, it can also be run in a virtual setup (in a distributed team).